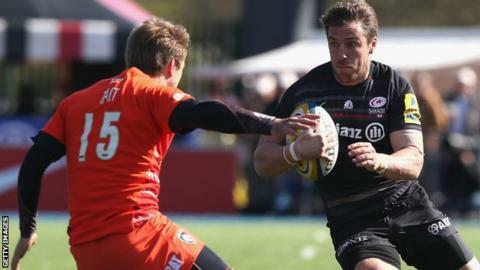 Saracens must draw on their previous experience if they are to beat Clermont Auvergne in their European Champions Cup semi-final, says wing Chris Wyles. Sarries have reached the last four of Europe's premier knock-out competition for the last three years and beat Clermont at this stage last season. "The biggest point of us getting into our third semi is that as a squad we have had consistency," said Wyles. "The guys have had these experiences and we can draw from that confidence." Saracens lost to Toulon in the Heineken Cup semi-finals in 2013 but beat French Top 14 side Clermont 46-6 at Twickenham last year, before then losing to Toulon in the final last May. The north London side also faced Clermont in the pool stages of this year's rebranded competition - winning 30-23 at home and being defeated 18-6 in France. Wyles thinks their previous meetings will stand them in good stead for Saturday afternoon's encounter in St Etienne (kick-off 15:15 BST). "We are not going into these things new and fresh," the 31-year-old told BBC London 94.9. "Clermont are one of the biggest teams in Europe but we know them. They have got a host of unbelievably talented players. "All the guys can take confidence from the fact that we have had big battles with them before." Saracens were the only away side to win at the quarter-final stage, overcoming Racing Metro in Paris thanks to Marcelo Bosch's late penalty, as Clermont beat Premiership leaders Northampton comfortably. Scrum-half Richard Wigglesworth believes they could succeed where Saints failed in France two weeks ago. "It is a hard task," said the 31-year-old England international. "They are in some unbelievable form and everyone saw what they did to Northampton, which not many teams do. "I back our boys to the hilt because they have been there, done it before and we are an experienced team. Let's see what we can do."